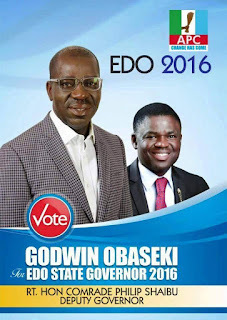 Home / featured post / Shuaibu Emerges Obaseki’s Running Mate! Shuaibu Emerges Obaseki’s Running Mate! Mr. Philip Shuaibu, a first term member of the House of Representatives, former member of the State House of Assembly and a godson of the outgoing governor, Comrade Adams Oshiomhole has emerged as the running mate of the APC candidate, Mr. Godwin Obaseki. The contentious issue on who would be the running mate to Obaseki was resolved in the favour of Shuiabu yesterday competent sources disclosed. However, some leaders from Edo Central Senatorial District who were not happy with the decision it was learnt yesterday were being pacified with the position of speaker. Vanguard learnt that Governor Oshiomhole had intensified efforts to get members of the state House of Assembly to return the speakership to the Central despite the near unanimity of the members to rally behind the incumbent, Mrs. Elizabeth Ativie. The lawmakers have argued that Ativie is Esan by marriage and said that they may not be any need to give the position to another Esan man. The decision to pick Shuaibu was based on the voting strength of Etsako people in Edo North which has three local government Areas. That was what the APC lacked in Edo Central, and that was what cost them the position. The Secretary to the State Government, Prof. Julius Ihonvbere, former Secretary to the Government, Simon Imuekheme, Victor Eboigbe, John Akhigbe, Peter Esele and Prince Joe Okojie were all in the race before the leaders resolved to pick Shuaibu.